Something that has been quite foreign to us was that we have no oven in our apartment. This is very normal for Chinese accommodations but definitely something new for us. I would say it has had an affect on our culinary adventures as we have felt quite limited by our two hobs. We decided to treat ourselves today with the purchase of a tabletop oven. There was a fair selection at Metro (warehouse type shopping that requires a membership) and our first choice was out of stock. Saying that though we weren’t sure what to base our choice on. There were no brands we recognised and just a few differences between models. We decided on one at the lower end of the spectrum, just to see how we liked it and if we would actually make use of it regularly. Day 1 and so far so good. 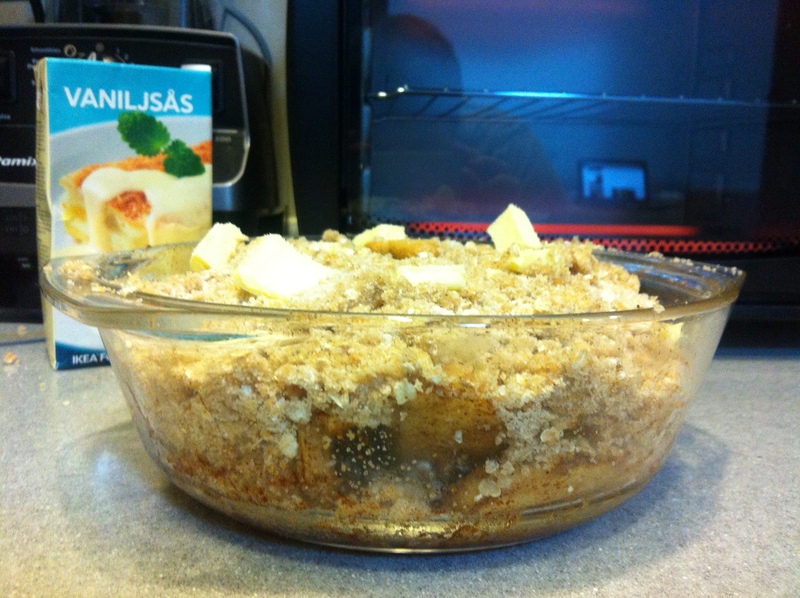 We baked off some frozen baguettes for a lovely bacon and egg sandwich and I have just attempted my first apple crumble. It looks and smells lovely, Mr T will have to give a verdict on it later. Just wondering how much (in yuan) it was. Looking to buy one for my apartment, or split it the cost with a friend. I believe it was 339 RMB, (55 USD or 34 GBP for the westerners reading). The higher priced models were about 700 RMB, but I think this one will work just fine. The brand is Changdi. Thanks for reading! !